I highly recommend this hostel, the staff was super friendly and the location perfect for what we needed. Room had a modern new furniture and amazing sea view. We have to visit it again! This hostel was amazing. We were only going to stay 2 nights but ended up extending because of the people we met and the staff. Maja is incredible, she has a heart of gold and made us feel so welcomed. Adam took us cliff jumping and was extremely helpful when we rented a scooter for the day. 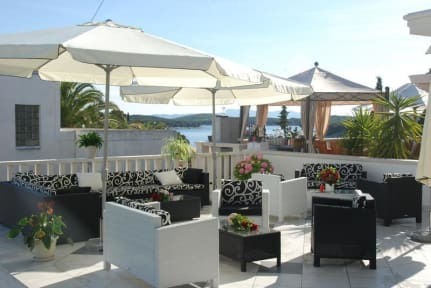 Overall I’d have to say that we are 100% coming back to Hvar because of the incredible staff. A beautiful island and definitely the best hostel I have ever stayed at. Gracias Maja, we love you!!! Has a party crowd but isn't actually a party hostel, which is nice because it's easy to meet people if you want to go out but if you choose to stay in you won't be bothered. Good hostel. Ice cream on arrival.the guy running the place was great, really helpful and welcoming, with good recommendations on where to go to visit/eat/party. Good location only 10 mins to main town. Private room even had kitchen which only shared witb one other room. Helpful staff, clean hostel, could do with a few more showers and bathrooms but still enjoyable stay. average hostel, good price, friendly staff. A bit of a tryhard party atmosphere and the people staying were either groups or on the older side, so as a solo traveller the atmosphere wasnt the best.